http:// Ah yes, the good old days of ducking under school desks, underground bomb shelters, Russian missiles in Cuba, Iranian hostage crisis, Nikita Khrushchev threatening to “bury” us, the brutal stomping of a revolution in Yugoslavia, people being shot escaping from East Germany to the West, gulags, Vietnam, MAD, the assassination of a president and the attempted assassination of another, Red China invading Korea… Heck that’s just off the top of my head. When was life simpler and easier? How old is John Kerry, 100? No, John, life wasn’t easier during the Cold War. American and European lefties were sympathetic to the Communists and we needed strong leaders like Ike, JFK Nixon and Reagan to combat them. Our enemies aren’t stronger now, our leaders are just weaker. Kerry has been negotiating the containment/non-containment of Iran’s nuclear bombs so he’s had a hand in this too. Iran is just jerking Obama around at this point, demanding a 1979 hostage-taker and accused murderer as their UN Ambassador. Well it fits the mullahs who run the country.http://israelmatzav.blogspot.com/2014/04/obama-signs-bill-barring-iranian.html So now Iran has run to the rabidly anti-West United Nations, which will likely side with Iran. This seems like another excellent time to leave that corrupt, dying, decadent pile of filth organization. You can hardly blame Kerry, though. Look at his boss. He’s dumber than a college sociology freshman major when it comes to foreign policy. http://nation.foxnews.com/2014/04/22/krauthammer-stupidest-line-ever-uttered-american-president-… Yeh, I knew it was stupid when I heard it. Naiveté is charming in a 14 YO girl but not in the President of the United States. How in heck can anyone have the nerve to support President Obama anymore? How can you believe in him at all, unless you’re a corrupt crony socialist, which should be an oxymoron but isn’t. Obama is bypassing Congress, which followed the lead of the American people by refusing to pass Cap’n’Trade AGW laws and regulations. He’s gonna do it all by his lonesome. Well he’s got some Big Green donors and George Soros on his side, so maybe Obama thinks they’re more influential than the American public. Executive Order: On Friday President Obama issued an executive order to prepare the US for the impacts of climate change. The order states that it will assist in preparedness and resilience. On the surface, resilience is important. One can compare the evacuation of some 800,000 citizens from the coast of India from last week’s cyclone with the poor handling by state and local officials of the evacuation of New Orleans from hurricane Katrina. However, given the record of this administration, the order is a disturbing action intended to avoid Congress. The executive order states: “A foundation for coordinated action on climate change preparedness and resilience across the Federal Government was established by Executive Order 13514 of October 5, 2009 (Federal Leadership in Environmental, Energy, and Economic Performance), and the Interagency Climate Change Adaptation Task Force led by the Council on Environmental Quality (CEQ), the Office of Science and Technology Policy (OSTP), and the National Oceanic and Atmospheric Administration (NOAA).” Thus, the foundation for the order is a previous executive order by the administration. The order also cites the U.S. Global Change Research Program (USGCRP), which is little more than a rubber stamp for the highly questionable findings of the UN Intergovernmental Panel on Climate Change (IPCC). Herein lies a great concern. For decades, the government-financed climate establishment, including the IPCC, has greatly exaggerated the certainty of its science, the influence of CO2 on temperatures, and the consequences of human-caused global warming. Now, we may be witnessing the dark side of Steven Schneider’s famous false dilemma. “So we have to offer up scary scenarios, make simplified, dramatic statements, and make little mention of any doubts we might have…Each of us has to decide what the right balance is between being effective and being honest.” For whatever motive, those who have chosen to be effective by exaggeration rather than being scrupulously honest are paving the way for authoritarian expansion of executive power, bypassing the democratically elected Congress. See Article #1 for Fred Singer’s discussion of the problems in the latest IPCC summary, links under Using Climate Change to Expand Executive Power, and http://en.wikipedia.org/wiki/Stephen_Schneider. There’s lots more at the link to WattsUpWithThat. This would be a terrifying power grab in the most balanced and nuanced administration, which Obama’ s is not. It’s not about science, it’s not about health, it’s not about disasters, it’s not about climate. It’s about money, power and changing the United States and the world. Why do we still belong to the UN? What? Fraud and lavish spending at a United Nations agency? The real news would be if we found a UN agency that wasn’t incompetent and fraudulent. Germany threatened that it “would be hard-pressed to help” Israel respond to the “severe diplomatic damage” which would allegedly have occurred if Israel failed to attend one more Israel-bashing session engineered by the U.N. Human Rights Council. However, the Council’s regular sessions occur three times a year and only Israel is specifically on the agenda every single time. In fact, the Israeli human rights record was last considered by the Council a mere five weeks ago, on September 23, 2013. Anti-Semitism is a bulwark of worldwide liberalism today. The only result that will satisfy liberals, socialists, and the United Nations is the utter destruction of Israel. Unfortunately, the United States now has a president and administration that agrees. When you’re too radical for UNESCO…. 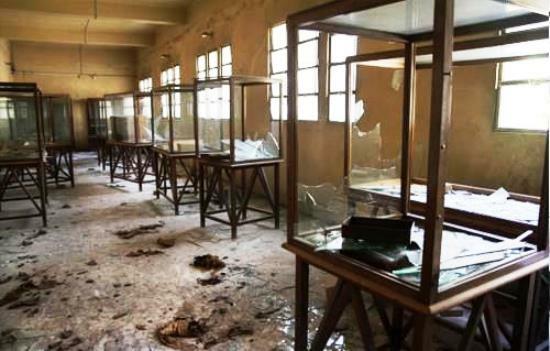 Here’s the trashed Malawi National Museum in al-Minya, Upper Egypt, after a visit from the Muslim Brotherhood. 1. They have no concept of hard work. No, really. It’s normal for members of an administration to burn out from fatigue and stress but these people never seem to work. 2. They say and do all manner of stupid things without any accountability from Obama or the MSM. Do you realize that Secretary of Interior Watts questioned letting the Beach Boys perform at the annual DC July 4th concert because he thought they might be too radical or disruptive? President Reagan summarily fired him for the divisive comment [Watts had already said a couple previous goofy comments but they weren’t horrible], even though they were good friends. Can you imagine? That’s a drop in the bucket compared to this insult-an-hour administration. The difference? The MSM. I guess our culture is much coarser, too. The real question, of course, is why does the United States still belong to the hateful propaganda crooks of the United Nations. As required by US law, we cut funding for UNESCO when they admitted the PA [Palestinian Authority] as a member. Guess what? UNESCO misses our money. Yet a close look at some of the examples offered by Bokova reveals that UNESCO is often superfluous or merely convenient rather than critical. Worse, the organization has made a number of poor decisions in recent years, decisions that undercut UNESCO’s claims to be a voice of moderation, ethical standards, and human rights. Brett Schaefer argues that if the US isn’t going to support UNESCO then we should leave the agency. Sounds good to me. The UN only wants our money anyway and we can’t afford to give any money to them. If we’re going to borrow money from China then we should spend it on something better than the nutty dictators at the UN who hate us. Let’s totally withdraw from the United Nations. I linked a couple of days ago to the story of the United Nations monitoring elections in certain locations with an eye to “voter suppression from conservative groups”. Since the NAACP is one of the source asking the UN to monitor US elections, you won’t be shocked to discover those certain locations are in the south. A representative in Alabama is pretty peeved and is sponsoring a resolution that all poll watchers must be US citizens. Frankly, having the UN monitor US elections just frosts my Cocoa Puffs in a big way. The UN monitoring elections and targeting conservatives is outrageous. Evidently the UN never heard of ACORN, but of course they favor Obama and liberals. At the request of several liberal-leaning groups including the American Civil Liberties Union, the NAACP and the Leadership Conference on Civil and Human Rights, the Organization for Security and Cooperation in Europe, a United Nations affiliate, announced it will deploy a team of poll watchers to polling sites across the country in order to monitor and document potential disputes.